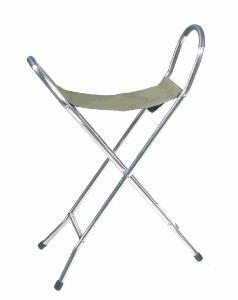 A sturdy and practical seat that can be used for support and balance when walking. Light in weight due to its aluminium frame, it opens out easily into a seat. The seat is made from heavy duty canvas and is 40cm wide. Overall walking height is 94cm (37") and seat height when opened out is 58.5cm (23"). The seat weighs 1.5kg and is able to support a user of weight not exceeding 125kg.